Unshakeable by Tony Robbins | Listen Free on Castbox. Tony Robbins pulls back the curtain on the 401(k). In this bonus episode, Tony discusses with Tom Zgainer the real problem with 401(k) companies and the source of the confusion surrounding it all. As Tom told Tony in Unshakeable, the 401(k) business is “the largest dark pool of assets where nobody really knows how or whose hands are getting greased.” As we know it, the 401(k) should be – and can be – a powerful tool for building wealth, if it’s used correctly. Unfortunately, this process has not been made easy. Hidden fees and deductions on top of what seems to be a good investment are some of the sources of confusion in 401(k) investments. We are an impatient society, and reading through pages and pages of financial disclosure agreements is not in our daily plans. This can be a daunting realization when we consider your 401(k) is what will fund your retirement and future family life. It is hard to find a good investment that eliminates brokers, commissions and high-paid middlemen. Tom goes into detail on why this is, how to avoid these situations, and how his business ABk is working to better your experience with 401(k) plans. It is not about living somebody else’s dream, it is about living a magnificent life on your terms. Tony’s shares his life mission on helping people find just that. To find this, there are two main focus areas you must understand: the science of achievement and the art of fulfillment. He goes into further detail in his book Unshakeable, but in this episode, you get a sneak peek on how to truly succeed. In the science of achievement, there are three steps. The first step to achieving anything you want is focus. There is no way to reach a goal if you cannot focus on it. The second step is one we generally understand because we can see it – it is to go beyond hunger, drive and desire. Tony discusses how to activate those emotions to get yourself to consistently take massive action. The third step to achieving whatever we want is grace. Not necessarily religiously, but acknowledgment of the fact that “life happens for you, not to you” and allowing that grace to grow with your appreciation. As important as achievement is, there’s a second skill that you’ll also need to master if you want to create an extraordinary life. This skill is what Tony calls “the art of fulfillment.” The art of fulfillment is an even more important skill to master because if you master the external world without mastering the internal world, how can you be truly and sustainably happy? That’s why Tony’s greatest obsession today is the art of fulfillment. There are two main principles to focus on:Growing and Giving. Tony explains why when we are growing and giving, we are living to our fullest. Know that money does not equal happiness; success without fulfillment truly can be the ultimate failure. If you have no one to share it with, what is the point – without your best success what is there to share? The 401(k) plan was a beautiful invention, but it seems to have lost its track. In this episode, Tony goes over the history of the 401(k) and where this amazing tool for financial wealth got derailed. You might not believe this, but for almost three decades, the companies providing 401(k) plans were not required by law to disclose how much they were charging their customers! Financial firms easily gave in to the temptation to take advantage of this lack of disclosure. Handling our retirement money is a sacred trust, and this is concerning. Now that the law has changed, the problem has yet to be fixed - the whole 401(k) system is still a black box. Most participants would not have the time or patience to go through the 30-50 page legal and financial disclosures, allowing for these companies to blindside you with fees and hidden agendas. Some 71% of people enrolled in 401(k)s think there are no fees, when, in fact, the vast majority of plans are characterized by huge broker commissions, expensive actively managed funds, and layer after layer of additional – and often hidden – charges. If you could save just 1% in fees, you could save over 10 years of retirement savings. Tony walks through the tips and tricks to not drowning in the sea of 401(k) confusion. In your life, you have probably sought out (or been approached by) a “financial advisor” to help you better understand your finances and reach your goals. Have you ever wondered whose interest they had in mind? You would never choose someone who did not have your best interest in mind, although most people do just that! In the strange twilight zone of the financial industry, about 90% of fiduciary professionals are not working within your best interest. If this is the case, how do you know who to trust with your financial future? In this episode, Tony Robbins clarifies what a broker is and how to identify one. Although, brokers are not the only ones to watch out for. Those with dual registration as a broker and financial advisor live in the grey area of interests where they could swing in your favor or that of their firm. Further, Tony reviews the 7 key questions to ask any advisor to uncover any potential conflicts or concerns that may impede your best interest. You will learn how to find an independent advisor who truly deserves – and will richly repay – your trust. “Where should I put my money?” In this episode, Tony shares seven facts that show you how the market works from his book Unshakeable. These facts can free you from all of the fear and anxiety that dominate most people’s financial lives. That’s why Tony calls them Freedom Facts. Based on more than a century of financial history, you can learn to understand that corrections, bear markets and recoveries follow similar patterns again and again. Once you have the power to recognize these long-term patterns, you will also have the power to utilize them. When taking control of your financial life, you are taking responsibility. Most people never take responsibility; they prefer to blame the market for whatever happens to them. But the market never took a dime from anyone! If you lose money in the market, it’s because of a decision you made – and if you make money in the market, it’s because of a decision you made. The market is going to do whatever it’s going to do. But you determine whether you’ll win or lose. You’re in charge. In the hustle and bustle of day-to-day living, it can be hard to focus on your quality of life. Never forget that your quality of life is multi-faceted including elements of your physical body, emotions, family relationships, career, mission and finances. If you live your life with a constant emotion of stress and frustration, then your quality of life is not at its peak, it is you feeling stressed and frustrated. In this episode, Tony shares several 2-minute messages from his novel Unshakeable to plant seeds into your mind to better shape your quality of life. Why stop at your quality of life when Tony can pinpoint stressors in your financial freedoms? Freedom Fact 1: On average, corrections have occurred about once a year since 1900. When you’re in the midst of a correction, you might find yourself becoming emotional and wanting to sell because you’re anxious to prevent the possibility of even more pain; you are not alone. These widespread emotions create a crisis mentality. Tony helps you understand how to be Unshakeable in the face of the inevitable storms. How often would you like your financial advisor to think of what’s best for you when giving you financial advice? Half of the time? All of the time? It almost seems like a silly question to ask; why would you say anything less than “all of the time?” The whole point of hiring an advisor is to have someone you can trust to help you make the best choices possible with your money. The sad truth is that many financial advisors don’t view this as the primary function of their job. Out of the 310,000 financial advisors in the US, how many do you think are required to act in your best interest? 50%? 25%? The shocking truth is that less than 10% of all financial advisors in the United States follow the fiduciary standard — which legally requires financial advisors to put your interests ahead of their own. It gets even scarier. Of the 10% of financial advisors who are fiduciaries, many are dually registered — meaning they can act as both a broker and a fiduciary. Legally, they don’t even need to notify you of their dual status, or whether they’re acting as a fiduciary or a broker at any given time! Talk about trust issues; would you ever go see a doctor who is only required to give you “good” medical advice during half of your visit? (And she doesn’t have to tell you which half of the visit.) If you can’t trust 90% of financial advisors to act in your best interests, and many of the remaining 10% will only act in your best interests some of the time, then who can you trust? That’s just the question Tony set out to answer when he wrote Unshakeable. Designed as your go-to financial freedom playbook, Unshakeable gives investors the knowledge they need to be truly unshakeable — unfazed by financial winters, prepared for anything, and wise enough to know who they can trust and who they can’t. Having someone by your side who you can count on to give you the best advice for your money is a key part in planning for the financial future you want. That’s why it’s so important that you make sure your financial advisor — even a registered fiduciary — keeps you on track, and doesn’t prioritize their own needs over yours. Even though the numbers look stacked against you, it’s possible to find a trustworthy financial advisor. There are over 5,000 firms and individuals in the US that will act in your best interest. 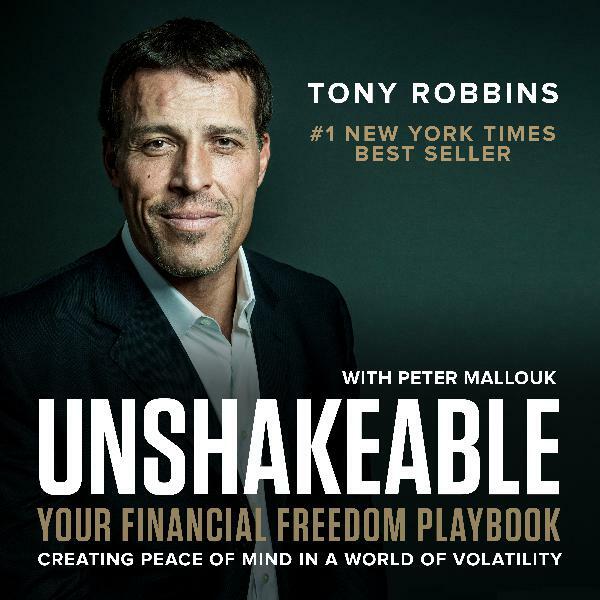 In this episode of The Unshakeable Podcast, Richard Bradley sits down with Tony and Peter Mallouk to explore the process of finding a financial advisor you can trust and how to identify the ways your financial advisor may be working for personal gain, instead of for you. This episode of the Unshakeable podcast has been brought to you in collaboration with Creative Planning, an SEC Registered Investment Advisor, where Tony Robbins is a board member and Chief of Investor Psychology. Mr. Robbins receives compensation for serving in this capacity and based on increased business derived by the company from his services. Really needed to hear this today. Immediately after the first episode, I went online and ordered the book. Looking into a fiduciary now! As usual, Tony finds a way to funnel complex issues down to the basic concepts that anyone can comprehend. These episodes are bite sized chunks of key concepts in his new book - Unshakable. Not to be missed. Another great resource for anyone to better themselves and those around them.